A row of police in front of the theater in Plauen, Saxony (now known as "Theater Plauen-Zwickau"), where the first mass protest in the GDR that security forces were unable to dissolve took place. Protests were subsequently held there every Saturday until the first democratic elections took place on 18 March, 1990. 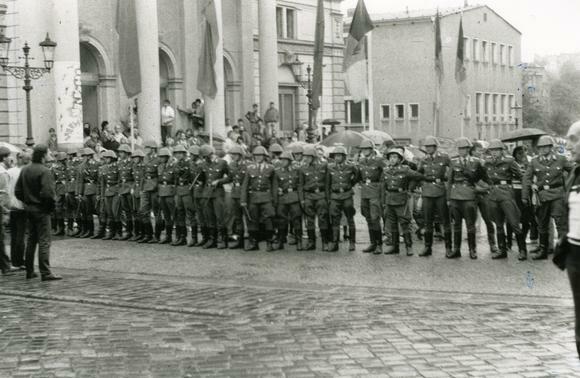 7 October is now commemorated in Plauen as the "Day of Democracy"
"Riot police with batons by the theater"